Both Yoko’s installations are based on the use of the so-called dichromic glass that lets through or reflects different spectrums of light. The artist is thus able to achieve breath-taking visual effects: her simple and visually convincing works transform the space into a meditative environment where a never-ending performance of live colour matter takes place. 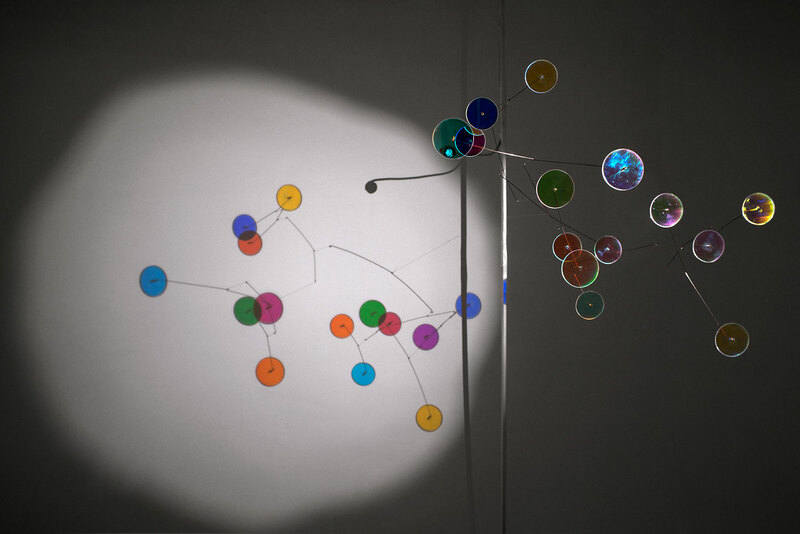 Melody dots 14 – Colour is a moving sculpture whose central element consists of several smaller glass coloured disks. Their movement creates an abstract choreography accompanied by a composition by the composer Dirk Haubrich. The ambiental »treat« titled Saiyah #2 transforms a gallery into a flexible geometrical landscape created with several glass plates and mirrors where colourful surfaces morph and change shape into a peculiar manifestation of chromatic harmonies. Yoko Seyama (Tokio, 1980) is a multimedia artist and scenographer specialized in spatial layouts and ambiental art. Her work with light explores both modern technology elements and natural materials. She’s collaborated with contemporary dance and music project as a scenographer. She’s graduated in architecture at the Musashino Art University in Tokio, while she finished her post-graduate studies in the fields of science and arts at the Royal Academy of Arts in Haag. She lives and works in Berlin.